I've been operating with lists all week, as I've deadlines to meet and weather to work around. Monday's deadline was to deliver "My Little Choia Garden" to the curator of its exhibit. CHECK! 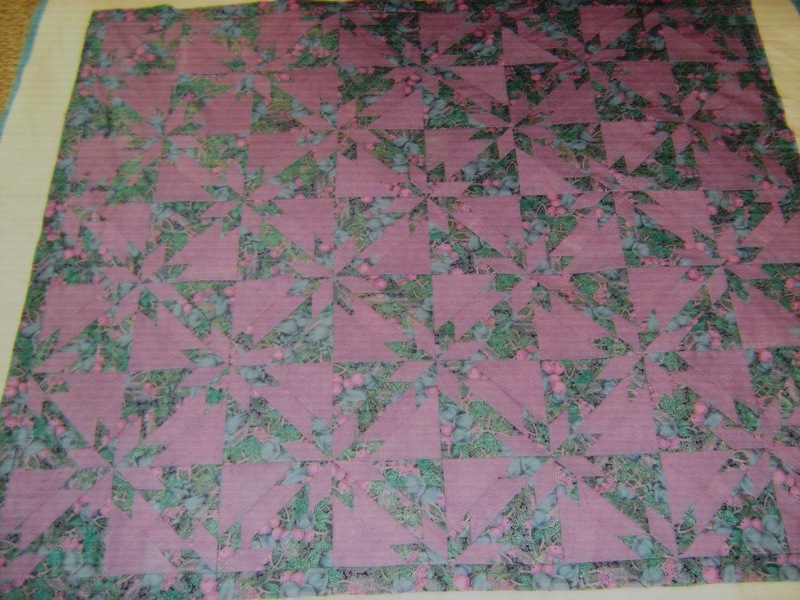 Yesterday I wanted to finish the top of P's "Hunter's Star" throw and mark it for quilting. CHECK! 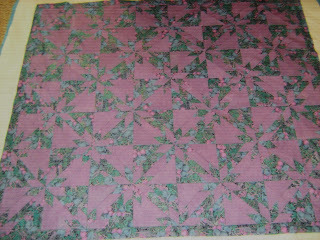 Today I wanted to sandwich the quilt and start the quilting. HALF-check -- if such a thing is possible. I ran into a snag -- or two. The quilting marks disappeared! I'd run into this problem when marking the circles on "MLCG", but they were small, so I took to marking them as I went along so that the embroidery could be put in the right place. The circles were batik fabric, so I thought perhaps that had something to do with it. It's the marker -- Tailorform Vanishing Fabric Marker, to be exact. It's supposed to disappear in 48 hours...but it seems to work too well, for it vanished almost completely between 5 p.m. yesterday and 9 a.m. today. I'd even folded the top with the marked side in, thinking that would keep the air from getting at it and removing the marks. Go figure. And the other small snag? 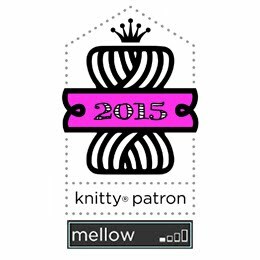 I have a small spool of thread that would work for quilting the top, but I'm concerned it's not enough. So...along with marker I'll be replenishing thread! The upside of today is that given the aforementioned wrinkles in my plans, I had to move on to other items on my list. This included taking out the garbage and cleaning my gutters and downspouts before the forecast rain hit (again). CHECK! Pretty, eh? I think it'll be a nice addition to her cool-weather wardrobe. Next on the list: graft the toes in cousin D's 'Plain Vanilla' socks and sew in the ends, while watching to see if the Severe Thunderstorm Warning actually produces a Severe Thunderstorm. 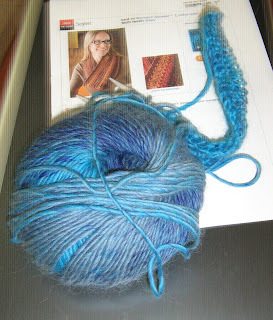 Oh...and check in with WIP Wednesday over on The Needle and Thread Network, to see what's cookin'! Two of my favourite things, that yarn, I had a couple of balls in an olive green, it is really nice to work with -- I crocheted a wristlet bag, which is waiting to be lined -- and one of my very favourite Quilt blocks, the Hunter's star! Well that is one marker that you need not worry about it lingering! Sorry you will have to redo your markings somehow. Sometimes I have the same problem with the markers, they work differently on each fabric, the marks stay longer on some and dissapears faster on another so I discovered a chalk pen (with a little wheel at the end)and draw small portions at a time, seams to work for me. But let me know if you find something else.